Brigitte Krenn is head of Unit of OFAI's Language and Interaction Technologies Group. You find us here! In previous positions, she was scientific head of the Research Studio Smart Agent Technologies of the Research Studios Austria and member of Seibersdorf Research, now AIT Austrian Institute of Technology. Earlier on she worked as a faculty staff and researcher at the Computational Linguistics Department of Saarland University and at IAI (Institute of the Society for the Promotion of Applied Information Sciences at the Saarland University). She holds a PhD in Computational Linguistics from Saarland University Saarbrücken, Germany and a Diploma in German Language and Literature, Psychology, Philosphy and Pedagogy from Karl-Franzens University Graz, Austria. 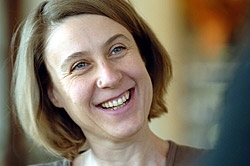 Brigitte Krenn's overall research interest lies in understanding and computationally modelling human communication and interaction capabilities. Her work centers around two pilars. The one is core language technology combining deep linguistic analysis and shallow corpus-based approaches to text processing. The other one focuses on multi-modal communicative interaction, including modelling virtual agent behaviours, multimodal dialogue, dialogue and memory, language understanding from the point of view of a situated cognizer, as well as assessing the implications of multimodal signals on the socio-emotional evaluation of the sender (speaker) by the receiver (hearer).